My vet who seems to collect tortoises no one wants anymore had told me about a tortoise that wasn't doing well with her other tortoises. She was worried as the others were always picking on her, pushing him from the food, chasing him from the burrows, etc. I had 2 Russian tortoises already from her and they were a mellow pair, so I brought Ron Weasley home. At first my youngest tried to assert some dominance, but that subsided soon enough and Ron found himself doing well. 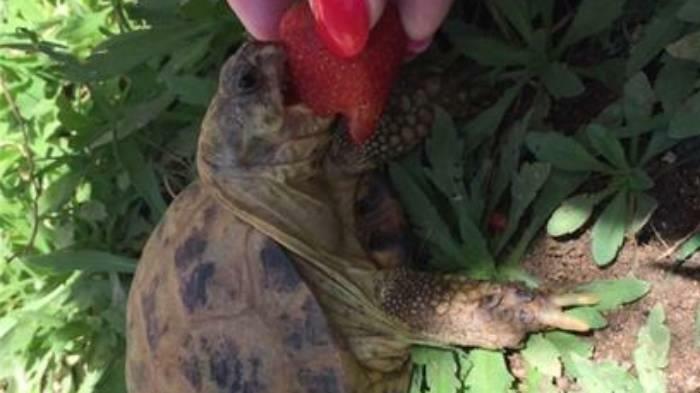 My tortoise garden has plenty of edibles for the tortoises, but I like to give them treats and supplemental food as well: belgian endive, kale, dandelion greens, strawberries, tomatoes, etc. Ron was a sweet boy, who always came when called. When i go out to their garden daily or 2x a day, he comes when he hears my voice, enjoys his neck petted and lets me handle him with ease. But I noticed an issue the first time I tried to hand feed him a treat. He just kept biting at the air, missing the tomato completely, unless I placed it in his open mouth. Poor Ron was blind. 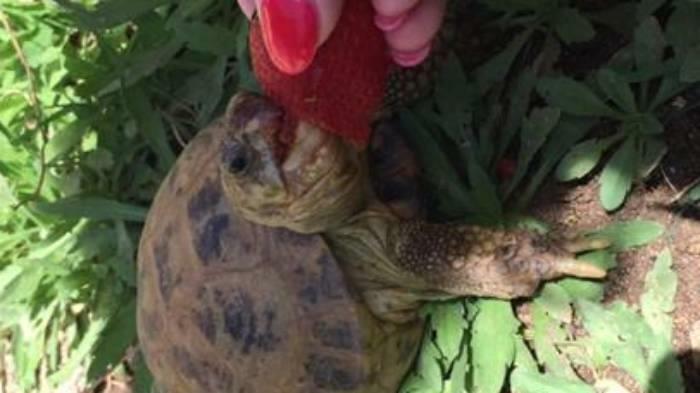 So I do hand feed him daily, although he has plenty to eat in the tortoise garden and I have seen him eat the lettuce, celery and other plantings regularly. But Ron has a sweet tooth for strawberries and loves tomatoes as well, so I buy him organic ones at the local farmer's market and hand feed him his treats as well as the endive, etc. He has a very hearty appetite and always comes to me no matter what. Tortoises have an excellent sense of smell and hearing too, which enables Ron to lead a good quality of life in the large tortoise garden I have. Not going to lie, this little guy is my favorite. 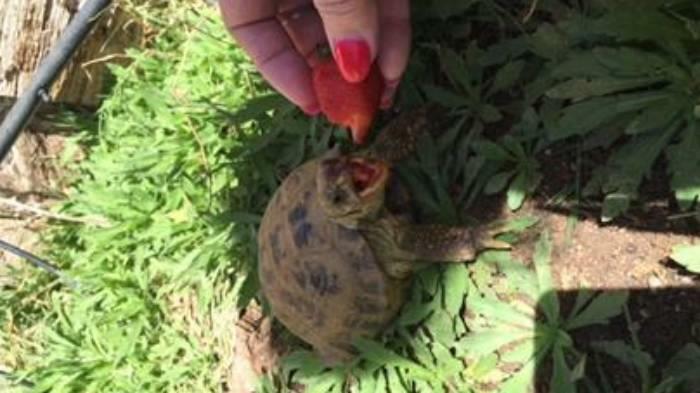 I love his happy-go-lucky tortoise attitude, he comes when called like a puppy and eats eagerly whatever I bring him. He has thrived since coming to live with me, his skin is healthy with a beautiful green tint, his shell is healthy, his limbs are meaty and he is happy to be here too.